This recipe is perfect for those long days on the job. You can have this delicious chicken dinner ready and on the table in about 30 minutes. It’s great cold weather comfort food too! 1. In a large skillet over medium-high heat, cook chicken in butter until meat is no longer pink. Add the water and bring to a boil; stir in the pasta. Reduce heat to medium; cover with a tight-fitting lid and simmer for 10 minutes. Add the broccoli florets; cover and simmer an additional 5 minutes or until the broccoli and pasta are tender and just a small amount of water remains in the skillet. 2. 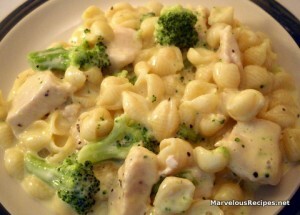 Stir in the milk, cheese, onion powder, garlic powder, salt and pepper, stirring frequently until the cheese is melted. Remove from the heat and stir in sour cream. Let stand 5 to 10 minutes before serving. Makes 6 servings. Ooh I’m adding this to my rotation. We made this tonight. Another great recipe from this website. The only thing I did differently was I used Heavy Cream instead of milk. I only did that because I had some left that was going to expire next week. Great recipe. Everyone loved it !!! !